THREE-LEGGED TRIANGULAR SHAPED CHURCH. 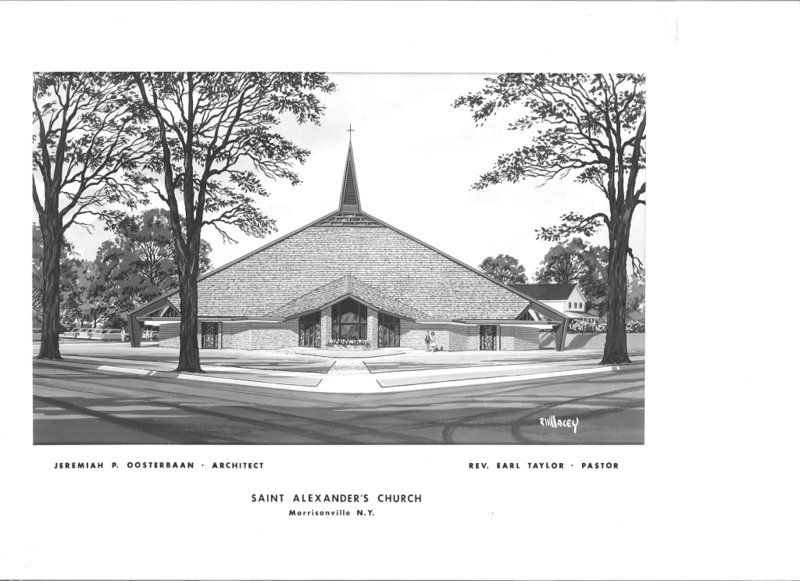 St. Alexander's Church, Morrisonville, N.Y., built on a tripod of exposed "weathering steel," combines striking beauty with the latest concepts in liturgical reform. Jeremiah Oosterbaan, Plattsburgh, N.Y., the architect, says the triangular shape was selected because it "is the symbol of aspiration...the human hands brought together in an attitude of prayer." The Church was built for the Ogdensburg, N.Y., Roman Catholic Diocese. General contractor was Harabern Homes, and the structural steel was fabricated and erected by Vermont Structural Steel Corporation, both of Plattsburgh, N.Y.. The structural engineer was Knight Consulting Engineers of So. Burilington, Vt. Bethlehem Steel Corporation provided the Mayari R "weathering steel" for the cross, steeple and three-legged rigid frame.